What a musical year it has been. There were some high points and real lows. The hardest moment this year came on June 4 when I got a call the day after playing an Afro-Semitic Experience concert and learned that Stacy Phillips had pulled over on the side of the road on his way from our concert to another performance and had a massive heart attack. When he died many of his friends and family came together and we gave him a farewell party at Café Nine that lasted the entire day. And while that gave us all a bit of closure, I find that every Afro-Semitic Experience and Nu Haven Kapelye performance leaves me feeling his absence and his presence. I’ve been playing on and off with Stacy since about 1997. He was one of the first musicians to join the Afro-Semitic Experience and his presence in the band was so critical to the formulation of our sound. He was, in his own way, incredibly open minded. He played many different styles of music and did so in a way that both honored the musical tradition of the style he was performing and allowed for his own personality to come out in the music. I met Stacy because we both had an interest in Jewish music. He wrote one of the first contemporary books that included performable transcriptions of historical recordings of Klezmer and his approach to Klezmer was deeply informed by those transcriptions. He was a stickler whenever we played one of his arrangements. In 1998 a group of musicians began a tradition of playing a concert of Jewish and Yiddish music on December 25, a tradition that celebrated its 20th anniversary just a few days ago. And Stacy was a part of that group and participated in the annual concert and in the ensemble, the Nu Haven Kapelye, that grew out of this. 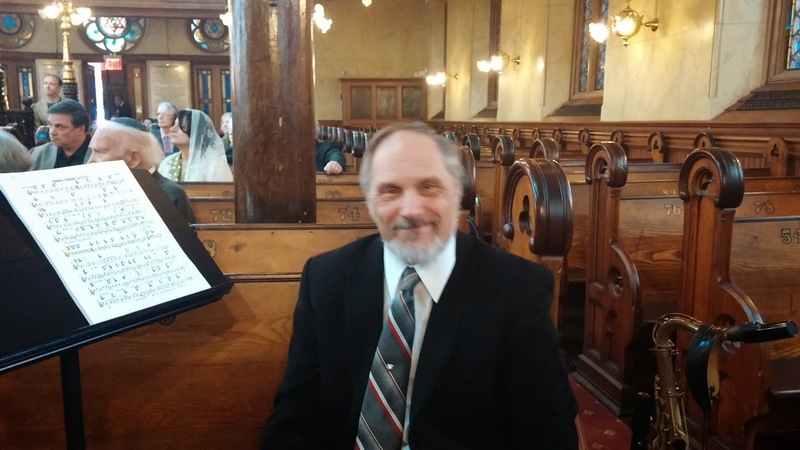 He arranged songs for the Kapelye and he usually spent time with the newest and youngest members of the Kapelye, encouraging them and sometimes writing special simplified arrangements as features for these new musicians. Stacy played in the violin section on the Nu Haven Kapelye’s CD, “What’s Nu?” At Stacy’s request I added a name to the credits on the album. It was his own private joke, but he allowed me in on it and if you look at the jacket of the CD you will see a name listed in the violin section, Mosheh Savitsky. That was Stacy’s sense of humor. Sometimes private and sometimes hilariously broad. One thing that I was struck by as I sat at Stacy’s memorial concert at Café Nine was the depth and breadth of his musical knowledge and how, as a result of that, so many of us knew Stacy in genuinely different ways. For over 20 years Stacy and I played so many types of music together: jazz, Klezmer, gospel, Yiddish songs, funk, synagogue songs, blues, Hazzonos and I don’t know what else. In all that time on all of those gigs there was, at least on the surface, almost nary a moment of Bluegrass. And yet surrounding me that day in Café Nine was a lot of Bluegrass. And the Bluegrass people I met knew Stacy incredibly well, so incredibly well—they knew him through a lens I had not experienced firsthand. We’d had complete and genuine experiences of this musical person that could not be more different. I know we are all complex people, but Stacy really took the cake. Complex, smart. Those are easy adjectives to use for him. And for all that people knew him or felt that they knew him, he kept a lot private. The only reason I knew his actual birth name and his birth date was because I booked the flights for the band. Believe you me, he swore me to secrecy on that. I’ve found myself sharing memories Stacy wherever I go and play with the Afro-Semitic Experience and with the Nu Haven Kapelye. But some moments are not shared, they just happen. With the Afro-Semitic Experience I find there are moments in performance where I expect him to come in with his part and even when it isn’t there, I can hear it in my mind’s ear. And we’ve had moments in songs where Stacy’s part was supposed to come in and we all just look at each other and almost stop playing. It’s that intense. That real. That momentary remembrance of what we had together and how musical and full of energy it was. And then, the moment is over as one of us plays the part that was developed by Stacy and we move forward in the song. The first time we played I wish I knew how it would feel to be free without him was probably the hardest. When we got to the ending section where Stacy usually played a duet with our percussionist, we stopped. We hadn’t thought about what we were going to do there. We all looked at each other and we almost didn’t finish the song. Then Will Bartlett stepped up and played a brief and emotionally filled duet with Jocelyn Pleasant. That moment stays with me. I’m going to close this remembrance with two photos. Stacy’s last gig was a concert with the Afro-Semitic Experience on June 3, 2018. I took a few candid photos while we were setting up for the concert. These photos capture some essence of Stacy that those of us played with him all knew—his humor and his seriousness are present in these last images. He’s ribbing Jocelyn as he talks to her. If he was feeling ill he sure wasn’t letting on. But that was Stacy Phillips. Here’s a link to something I think is also of importance and value, Reverend Barber’s speech. His words that evening were a call to action and a powerful reminder that there is still much to do in our nation to achieve equality and equity for all our citizens. I hope you will take some time to watch or at least listen to what Reverend Barber said that evening. I do believe that our message and our music harmonized with Reverend Barber’s prophetic words at the URJ Biennial. Our performance was only the beginning of a great experience for me as over the next four days I attended services, concerts, and learning sessions where I got to meet many rabbis, cantors, professionals and lay people who are involved in trying to make a positive difference in the struggle for social justice. The learning sessions on criminal justice and racial justice were among the high points of my experience. I heard from so many people who are involved in the fight for social justice in their communities, sometimes winning, sometimes losing, but always striving. As I observed and participated in these sessions and services I felt moved and I felt empowered. week, on Friday, January 12, the Afro-Semitic Experience will mark its 20th anniversary by sharing our music at an interfaith service to celebrate and honor the memory of Dr. Martin Luther King, Jr. This year we’ll be sharing our music at Congregation Mishkan Israel in Hamden, Connecticut, it’s the synagogue where we first started our project twenty years ago. This year is Rabbi Herbert Brockman’s last year leading the service as he will be retiring from Mishkan Israel in June. So this is a service that will be emotional and intense on many levels as Rabbi Brockman has always served as a beacon for social justice in the New Haven area and while we welcome change, in this case it will be bittersweet. The service is at 7:30 pm, but we will be giving a short pre-service concert beginning at 7:00 p.m. I hope you can join us for the entire evening as it sure to be one filled with hope and tears. Congregation Mishkan Israel is located at 785 Ridge Road in Hamden, Connecticut. This Sunday, January 7, I will be playing at the jazz brunch at the Elm City Market with my group Bassology. For this performance, I’ll be joined by Warren Byrd on piano, Saskia Laroo on trumpet and Jesse Chevan on drum set. Music begins at 10:30 and goes till 1:30 p.m. Also, musicians are welcome to bring their instruments and sit in. Come on down to get some groceries, eat some brunch and dig some sounds. One thing I enjoy as a musician and a creative person is developing/creating works that are spiritually and musically moving and satisfying. I enjoy the intricate challenges of merging my religious/spiritual life with my musical life and I have thrived on that for as long as I can remember. My Days of Awe and Further Definitions of the Days of Awe projects are good examples of how I have been able to find new ways to express traditional synagogue songs and music for the high holy days in an entirely new light. 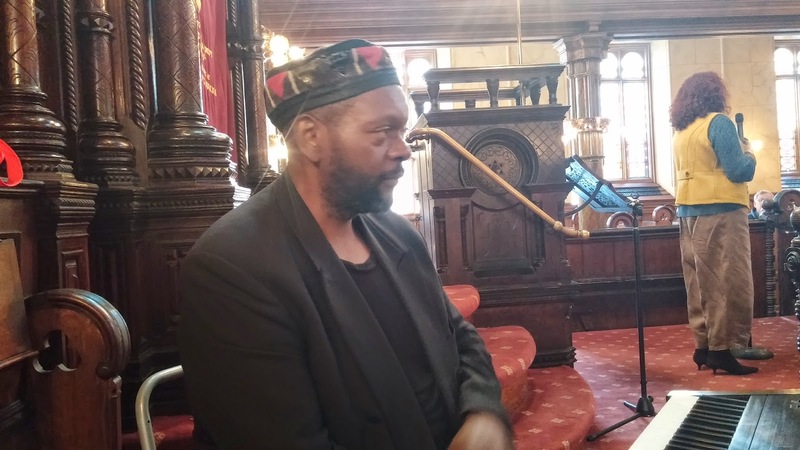 To that end I am excited to let you know about two synagogue services coming up this month that I have helped to develop and arrange and will be playing with the Afro-Semitic Experience. The first service is coming up next weekend. We are playing a Selichot service in West Hartford at The Emanuel Synagogue. Yes, we’re beginning the High Holy Day season with some spiritual music making here in the state where I live. Playing a Selichot service is nothing new for the Afro-Semitic Experience. We’ve been involved in playing that service now for the past 15 years or so, ever since we began work on the music for the Days of Awe CD that we released back in 2003. And this year we are going to give a service not with one, not with two, but with five cantors!! We have some new pieces and some revised older pieces planned for the service. And yes, we are going to give a little sermon in song during the evening so look out for an Afro-Semitic Experience moment in the midst of it all. tiny tangent of respect and gratitude: One direct result of the Days of Awe project was that we were introduced to Cantor Jack Mendelson. We played our first Selichot service with him and accompanied him at his synagogue for over a decade. And through our experiences working with Cantor Mendelson our knowledge of the liturgy and music for Selichot also grew. Even though Cantor Mendelson is now retired we continue to be invited to play at synagogues and to share the music we have arranged and developed and we continue to be grateful for the guidance and support he gave us during those many years of learning together. 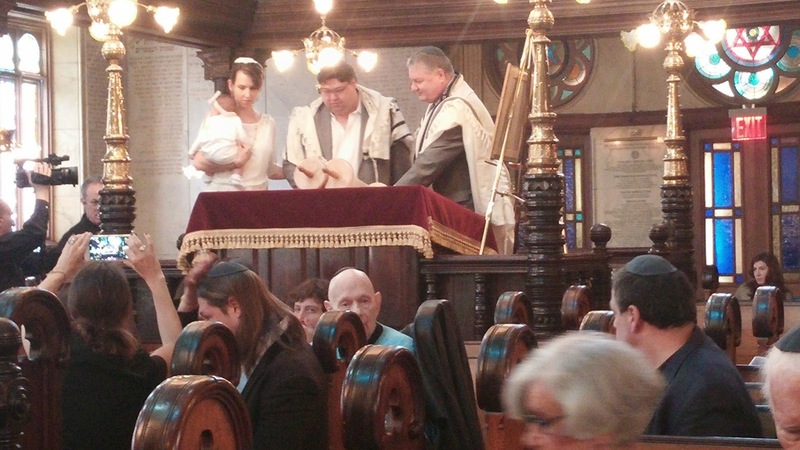 Our second synagogue service is going to be in South Orange, New Jersey at Temple Sharey Tefilo-Israel. We are going to be playing two services for Rosh Hashanah eve, one at 5:30 p.m. and the second at 7:30. For me this is a moment of arrival as I have wanted to make music for these services for a very long time and now we are getting to play not just for the service that comes just before the High Holy Days, but actually on the eve of Rosh Hashanah! How cool is that!! I mean, how many bands do you know that are playing for Rosh Hashanah services? I could imagine there might be a few, but the only one that I know about is the Afro-Semitic Experience. We’ve been talking, planning, and rehearsing these two services with Cantor Rebecca Moses and both services are going to be open to the public so if you wish to attend the synagogue will welcome you with open arms as long as you call in advance. If you want to observe Erev Rosh Hashannah with a wonderful community and share in our musical celebration of 5778 please contact the temple office of Temple Sharey Tefilo-Israel at 973-763-4116. The early service is going to be very family friendly with moments for dancing and interaction. The later service will be a little more somber and we’re planning some pretty interesting arrangements that are intended to bring you into the High Holy Days in a way that is spiritual and visceral. Please call the synagogue if you wish to join us. Other gigs in the coming weeks. This Saturday evening, September 9, I am hosting a jazz jam from 6:30-9:30 p.m. at Fornarelli’s in New Haven. I’ll be joined by Drew Fermo on piano and you are all invited to come hang out to hear the music. Musicians please come on over and sit in with us. We’re looking forward to a good evening of music making. Fornarelli’s Ristorante is located at 99 Orange Street in downtown New Haven. Next weekend (not this one) is just before my birthday so I am going to celebrate my birthday at all of my gigs (well, maybe not my Selichot service, but who knows). The weekend begins with a Friday night performance (September 15) with my group Bassology at the 323 Restaurant and Bar. Music begins at 7:30 p.m. I’ll be joined by Will Bartlett on sax, Warren Byrd on piano and Jocelyn Pleasant on drums. The 323 Restaurant and Bar is located at 323 Main Street in Westport. At 3:00 p.m. on Saturday, September 16, I will be playing with the Nu Haven Kapelye at the Whitneyville Fall Festival in Hamden. Enjoy a great community event with live music including our set of Klezmer. The festival takes place on the fields of the Whitney Cultural Commons, 1253 Whitney Avenue in Hamden. And later that day I will be in West Hartford for the Selichot service. Then on Sunday, September 17, I am playing at the jazz brunch at Elm City Market with my swing and blues group, Bassology. For this performance, I’ll be joined by Will Bartlett on sax, Warren Byrd on the keys, and Jesse Chevan on drum set. Music begins at 10:30 and goes till 1:30. What a perfectly morning, you can shop, eat brunch, hear great jazz and then wish me a happy birthday. Elm City Market is located at the corner of State and Chapel streets in downtown New Haven. I hope you will join me and my friends at one of these upcoming performances or worship services. This last week of July is filled with music of all kinds and I’d be thrilled if you came out for one or more of these upcoming performances. I am basically having gigs with almost of all of my various projects and each one of them promises to be exciting. This Friday, July 28, I am hoping for some good weather as I am playing outdoors at noon in Hartford at the Old State House Farmer’s Market with the Nu Haven Kapelye. That’s right Hartford friends. Now you can hear what kind of mishegas we’ve been up to in New Haven for the past twenty or so years. Klezmer and Yiddish swing come to Hartford and I hope you can join us. We’ll be playing music from What’s Nu, the CD we released earlier this past year as well as some new arrangements that I’ve put together for the group. Music begins at noon. The Old State House is located at 800 Main street in Hartford. On Saturday, July 29, I’m back in New Haven for a duo gig with Jeff Fuller at Fornarelli’s, one of the last clubs in the New Haven area that still has a real piano and a regular jazz policy. I know you might think of Jeff as a bass player but his piano chops are off the chain. Last time we played at Fornarelli’s we had a blast. This time we’re inviting our students and friends to come and sit in with us. If you are a musician please bring your instrument and sit in with us! It’s going to be a blast. Music starts at 6:30 and who knows how late we’ll go. Fornarelli’s Ristorante is located at 99 Orange Street in downtown New Haven. On Sunday, July 30, I am playing at the jazz brunch at Elm City Market with my swing and blues group, Bassology. For this performance, I’ll be joined by Will Bartlett on sax, Chris Casey on the keys, and Jocelyn Pleasant on drum set. Music begins at 10:30 and goes till 1:30. What a perfectly American experience, shop, eat brunch, and hear great jazz. Elm City Market is located at the corner of State and Chapel streets in downtown New Haven. On Monday, July 31, at 7 pm the Afro-Semitic Experience is playing a concert at Tower One in New Haven. This concert is free and open to the public. The band is excited to get this chance to play together locally and we hope you’ll come out to hear us. Tower One is located at 18 Tower Lane in New Haven. And then, on Thursday, August 3 I am playing, for the first time ever, in Stamford with a trio version of Bassology at Villa Italia. Joining me that evening will be my Afro-Semitic Experience bandmates, Warren Byrd and Saskia Laroo. Music begins at 7:30 p.m. Villa Italia is located at 26 Mill River Street in Stamford. A busy couple of weeks and I do hope that you will join me for some very musical moments. Just a little Mardi Gras reminder note and a rescheduled snowed out performance. This coming Tuesday, February 28 is Fat Tuesday and that means that I will be directing my annual Mardi Gras conc­­ert at Southern Connecticut State University. I'm been working with my students on a program of music from New Orleans that runs the gamut from traditional jazz to New Orleans funk and rhythm and blues. We’re having a lot of fun learning this material and I hope you can join us for a night that’s going to really have a big easy flavor to it. You can expect a parade, beads, and lots of good music. We’ve got a program of songs made popular by Louis Armstrong, Dr. John, Huey "Piano" Smith, the Dixiecups, Allen Toussaint and other legendary New Orleans artists. The concert is at 7:30 p.m. in the Charles Garner Recital Hall (located in rm C-112 in Engleman Hall). Admission to the general public is $5 a person. For more information please call the SCSU Music Department, 203-392-6625. As I mentioned in my last newsletter the centenary of what is generally acknowledged as the first jazz recording is coming up this Sunday, on February 26. What’s surprised me is how little this major milestone has been mentioned anywhere in the media. But we will be acknowledging and celebrating this milestone in jazz history at our concert on Tuesday. The SCSU jazz ensemble has been working hard to learn those two songs, Livery Stable Blues, and Dixieland Jass Band One-Step, that were recorded on February 26, 1917. We’re looking forward to sharing them. On Sunday, March 5, at 2:00 p.m. I will play a duo jazz concert at the Pequot Library in Southport with Rex Cadwallader. We were supposed to give that concert a few weeks ago, but we were snowed out so we are grateful that the library was able to reschedule this performance. The Pequot Library is located at 720 Pequot Ave. in Southport. Laissez les bon temps rouler!!! The next few weeks for me are going to filled with some really interesting music and most of it is happening locally. I would be remiss if I didn't let you know what I am up to. Tomorrow night, at 8 pm I am playing a set of music with Isabella Mendes' new Bossa Nova Project at Best Video. Isabella has assembled some terrific players to accompany her in a tribute to Antonio Carlos Jobim, who if her were still alive, would be celebrating his 90th birthday today. Joe Carter is on guitar, Tim Moran is covering the woodwinds, and Joe Murfin really lays it down with percussion and drum set. Best Video, for those of you who haven't yet enjoyed this space, is located at 1842 Whitney Ave in Hamden. On Sunday, January 29 at 4:00 p.m. the Afro-Semitic Experience will be participating in an interfaith worship service to Lift Ev'ry Voice in Song, a service to honor and celebrate the 50th anniversary of Christian Community Action. The service will be held at Star of Jacob Christian Church at 506 Howard Avenue in New Haven. For those of you who are unfamiliar with them, Christian Community Action is an organization that is the real deal. Every day they are in the community looking out for those who truly need help and support. Their mission is to provide help, housing, and hope to those who are poor in New Haven. And every single day, for the past 50 years, with no days off ever, that is what they have been doing. I'm honored that the Afro-Semitic Experience was invited to celebrate this organization and I hope you can take some time this coming Sunday to be a part of it. Featured performers include The Heritage Chorale of New Haven, Inc., Afro-Semitic Experience, Morning Glory Dancers, Unity Boys Choir, Trinity Girls Choir, Salt and Pepper Gospel Choir, and Star of Jacob Christian Church Choir. All faiths and all people are welcome. Parking provisions are at the Church and at Roberto Clemente Leadership Academy/School at 360 Howard Avenue. It is it about a block away. It's a service so there is no admission charge, it is free, but of course your support of this organization that is really making a difference in the community would be appreciated. At an event like this I think you should expect to hear a joyous noise. Those of you in the Hartford area will be happy to know that the Afro-Semitic Experience is finally coming back to share our music in the community. On Sunday, February 5, the Afro-Semitic Experience will be giving a concert at the Hartford Public Library as a part of their Baby Grand Jazz Series. The concert begins at 3:00 p.m. and is free to the public! On Sunday, February 12, at 2:00 p.m. I will play a duo jazz concert at the Pequot Library in Southport with Rex Cadwallader. The Pequot library is located at 720 Pequot Ave. in Southport. Again, I know what happens when I play with Rex so I think you can expect a joyous noise. Finally, the centenary of what is often acknowledged as the first jazz recording* is coming up in just about a months time, on February 26, the same day as the Oscars. Wouldn't it be cool if the people from La, La Land, the new jazz-inspired move and the rest of the Academy in some way honored this extraordinary landmark date. I am dubious as to whether they will, but you can rest assured knowing know that whenever there is an opportunity and cause to celebrate with a joyful noise, I will be doing just that. The coincidence of Fat Tuesday and the Centennial of Jazz is going to make for a special evening that I hope you attend. On Tuesday, February 28, I will be directing a Mardi Gras concert at Southern Connecticut State University. I'm already working with my students to learn the two very first songs ever released as jazz numbers. And the rest of the music we're planning will really raise the Mardi Gras spirit to a proper level of celebration (songs by Louis Armstrong, Dr. John, Huey "Piano" Smith, the Dixiecups, Allen Toussaint and other legendary New Orleans artists). The concert is at 7:30 p.m. in the Charles Garner Recital Hall (located in rm C-112 in Engleman Hall). Admission to the general public is $5 a person. For more information please call the SCSU Music Department, 203-392-6625. Busy month but in that good way. Hope you can join me for some or all!! *"Livery Stable Blues" and "The Dixieland One Step", recorded on February 26, 1917 by the Original Dixieland Jass Band. Yes, this recording's place as the first jazz recording has been contested, but like Louis Armstrong's believed versus real birthday, sometimes the myth has value in being knowingly perpetuated. Where does this all begin? Hard to say. I imagine the first inkling of this project would mostly likely be in the fall of 1998 when I suggested the idea of organizing and putting on a concert on December 25 to Cantor Shoshana Lash at Congregation Mishkan Israel in Hamden. She was willing to run with the idea and see where it would go. There were enough people interested so I pulled together some lead sheets and we had a few rehearsals and managed to present something nice that maybe lasted about 45 minutes or so. And by some standard we decided that the concert was a success. I’m not sure what the turnout was for that first concert, but by the third or fourth concert we were well over 100 people in attendance. And over the years the audience has grown so that we have had as many as 200-250 people in attendance. So far this concert has managed to exist for 18 straight years. And that includes one year when I took a break so that my family could visit our son who was working in Qatar. The December 25 concert has evolved from just a break in my year into a source of creative inspiration. Musically, for me, there is always the feeling that somehow every year the December 25 concert has to be fresh and new and better than the previous year. And for me that has meant constantly being on the hunt for repertoire. The music I seek or perhaps initially sought was preferably something that wouldn’t be too hard to adapt as I needed to prepare and organize everything as expeditiously as possible. For the first few years that we did the concert I would hunt around for lead sheets of Klezmer and Jewish music. Plus people who wanted to sing songs were welcome to bring in their songs and we would hammer out pretty quick arrangements for the show. Over time I was able to build a library of Jewish music that we really liked playing. It took quite a few years of searching and collecting but in time I accumulated a number of collections of music that I found reliable musically and that I could use for developing arrangements for the group. How did I even learn about these collections is its own story. One thing that really helped in my education was being a member of an online e-mail chat group. The jewish-music list, curated by Ari Davidow was an invaluable resource. So much good information was and continues to be passed around in that group. I don’t know where I first learned about each of these sources, but I know I must have encountered at least a few as a result of being a member of this on-line community of like-minded music lovers. The first resource I came across that really resonated with me was a pair of music books, the two International Dance Folios originally published by Kammen Music in 1924. These two folios were collections for dance band musicians and were terrific resources. Essentially the books contained melody lines in all keys, as well as rhythm section parts. Over the years we have played a lot of music from those books. Next I got hold of Stacy Phillips’ book of Klezmer tunes published by Mel Bay and that helped us a great deal as well. Those lead sheets were used a great deal in the earliest years of the December 25 concert. One of the big repertoire breakthroughs was tracking down and getting the only two collections of Klezmer ensemble arrangements that had parts for instruments in all keys. Most collections were strictly in C and Bb and there was little written for Eb instruments (in a way that should have been a clue to me that I was veering out of the zone of tradition since the most common of all Eb instruments, the alto saxophone, is not a traditional Klezmer instrument). First I found Ken Richmond’s book of charts that he wrote for the Yale Klezmer band and then soon after the Maxwell Street Klezmer band published their terrific collection of Klezmer arrangements. To this day we open most of our performances with the Maxwell Street arrangement of “Russian Sher”. My search for musical material eventually led to Beregovski’s collections of Klezmer and Jewish music from Russia and I soon used many of the pieces in those collections to write my own lead sheets for the band. But from a creative point of view I think the big moment of creative transition for me happened in 2011 when I was invited by Rabbi Greg Wallto play bass in the Ayn Sof Arkestra, a Jewish big band he had founded. The group had a monthly gig at the East Sixth Street Synagogue in New York. I began traveling down from New Haven to New York once a month to be a part of this project. I loved meeting and playing with these musicians all of whom were strong players with great reading and improvising chops. As the group developed Greg invited the members of the band to bring in their own tunes and arrangements and to write for the group. I was excited by the possibility of getting to hear some of my ideas played by a big band and over the year I put together about three or four arrangements and original pieces for that group. It was my first time writing seriously for a large ensemble and when that project ended for me I was disappointed. I’d gotten bit by the writing bug and I wanted to continue to write for a large Jewish big band. And then it hit me. I had been writing and arranging for a big Jewish band since 1998 but because of my own narrow mindedness I had not been thinking about it that way. It took the end of my tenure with Ayn Sof and my continued desire to write for a big group to help me understand the gift that was this December 25 ensemble. As I wrote and transcribed simple lead sheet arrangements for the December 25th group I discovered that these players possess an insatiable appetite for new music. Anything I presented they were ready and willing and (mostly) able to play. I was so used to working mostly with ear players, however, and it took me a while to understand that some of these musicians really wanted notated guidance. Ear players are more than willing to take musical risks, but so many of the players who were involved did not have that agenda and I wanted to be open to finding ways to keep them involved in the project. And so I began to become more aware of arrangement and how to present the music. While that might seem obvious to a trained musician, for me it was a process of becoming aware. I became aware that I could shape a piece and not just play it straight forwardly. I became aware that the group could really reach and pull itself into a shape that would allow a group of community musicians to really play this music. And I began to get even more aware of nuance than I ever had been before. And so about a decade or so into this project I began to get serious about the arrangements for the group. Over time I found myself writing more and more frequently for the band. And I also have encouraged other members of the group to also contribute their work. Yoni Battat brought in a number of vocal arrangements, Christina Crowdergave us an instrumental arrangement and also wrote several arrangements for the vocalists. And Louis Polissontranscribed and arranged Gross by Balkan Beat Box. We were finally to the point where at least two or three of the arrangements for the concert were developed by me or some other member of the group. My musical tastes are wide and so it should come as no surprise that the arrangements I’ve developed really run the gamut. Some are through composed without any room for soloists to improvise and others are almost like a jazz-big band chart in their structure with significant room left for improvisers to do their thing. What most of these current arrangements have in common is that I have a group of musicians who really want to play them and turn them into something tangible and musical. And there is great satisfaction in having an outlet for my explorations of arranging, instrumentation and part writing. About a year and a half ago I decided that time had come to document some of the work we had been doing and I was able to obtain a grant to record my arrangements. Here we are, nearly 19 years into this project and we are finally making to have a studio quality recording that nicely documents some of the music that we have been making here in New Haven on December 25 and otherwise. It’s a great feeling. Okay, we’re almost at the part of this essay where I tell you a bit about each of the tunes on the What’s Nu CD. But before I talk about the music I want to talk a bit about where we recorded the music. I knew from the start that where we recorded the basic tracks for this album was going to matter a lot. I was concerned with finding a room with a good sound and also a room that would work from some kind of spiritual perspective. I was also aware that there were a lot of musicians in the group who were recording for the first time and so having the right feel to the space mattered to me. And there were some obstacles to overcome. Getting a good sounding recording and recording over 30 people at once is not an easy combination to make happen. And I really wanted to use a room that was large enough to accommodate the full ensemble. That turned out to be its own challenge. The old cavernous New York recording studios where Duke Ellington and other big band leaders recorded don’t exist anymore and besides if they did they would have been well outside of our budget. Room after room in the New Haven area turned out to be unavailable for this recording project. And then, at almost the last minute we were given the okay to record in the Chapel, the smaller sanctuary space at Congregation Mishkan Israel in Hamden. Spiritually this made a lot of sense, since we have been playing Mishkan Israel (albeit in the social hall) every December 25 since 1998. But this space turned out to be more than just great from the karmic spiritual perspective, the room turned out to be an acoustic space that was perfect for a large ensemble. For example, please take a moment to give a listen to the drum sound on this recording. It’s really amazing. And it’s all natural. We didn’t use any added reverb to find that big deep reverberating drum voice and that great splashy sound on the cymbals. That is all the sound of the CMI small sanctuary. We recorded basic tracks for 13 different pieces in two days. That might sound impressive but that’s what you’re stuck doing when you are working on a tight budget. You make do. And so we made did. Here are some thoughts about the songs, the arrangements, and I have also sprinkled a few origin stories here and there. Hope the stories and rambles are enlightening are worth slogging through. Kiev Sher is a tune I found while reading through tunes in the Beregovski collection. There was about a three year period where I used the music in that collection for my daily sight reading practice. I learned a lot from the exploration of the Klezmer themes that Beregovski compiled. And I learned a bit about me and my relationship to phrasing as I tried to make sense of how these melodies all strung together. So this was one of the tunes that I sight read in that collection that I liked so much I put a star next to it and would come back and revisit from time to time. The ideas for this arrangement were primarily generated from the music of David Bowie and the drumming and generous spirit of Aaron Alexander. The David Bowie influence can be is in the way the rhythm section supports the melody (think “Fashion” or “Stay”) as well as the horn lines during the solo section. Aaron Alexander has this great way of making klezmer drumming sound traditional and super funky at the same time. A few years ago I was attending a wedding (Louis Polisson and Gabriella Feingold’s) and Aaron was playing drums with this great group of Klezmer musicians. Aaron didn’t play Kiev Sher, but he played with some of the energy that this arrangement tries to express. Especially the last part of the piece. Joseph, Joseph (Yosl, Yosl). I was playing a gig in Brooklyn with Paul Shapiro where we were asked to play some background music. Paul suggested that we play Yosl, Yosl. But I couldn’t. I didn’t have a fake book and I didn’t know the tune. Paul suggested I check it out and for whatever reason that suggestion stuck. And it was the beginning of a fascinating exploration. I began by finding recordings and listening. I really got into this song in every configuration that I discovered. And then I began to listen to try and find my arrangement. What did I want to put that would work for the Seltzers singing with the Kapelye? Before Paul had suggested the song I’d never played it before and so my first listen sessions began. I started with a recording by Abe Schwartz and it just grabbed my ears and wouldn’t let go. And of course when I start listening to a song, every new discovery seemed to lead to two more (the longer story here which I won’t go into is that I am now on the lookout for these Yiddish swing tunes that can be both jazzy and klezzy). The slightly shorter version of the story involves discovering the popularity of this song under the name Joseph, or Joseph, Joseph on the Gypsy Jazz scene and then from there discovering the Andrews Sisters version. I think this arrangement has a little bit from each of those explorations, though to me what Jackie and Hedda have created with this arrangement goes beyond homage and presents another cool perspective on this song. I like the way the band swings on this tune and our featured soloist really has a time with this one. At the time of this recording tenor soloist Miles Singer was in his freshman year in high school. His tone is perfect for this tune and he really struts his stuff. Belaia Tserkov Freylekh and Skotshne are pair of dance tunes I found in the Beregovski collection. It’s one of my earliest attempts at taking my arranging skills beyond playing lead sheets. I had some basic personal goals for this particular arrangement. I was interested in writing a feature for a member of the ensemble and I was interested in trying to create something that would last longer if we were playing for dancers. So I thought I’d try arranging a little medley of Klezmer dance songs. Making a medley could have been a pretty simple and straight forward task. I’d heard plenty of medleys where the switch from song to song was done without any transitions. But I wanted to try and write a transition. I tried a few and this is the latest iteration. When we play it right it really pushes you into the Skotshne. And that brings us to my first foray into writing a Klezmer feature. I found this tricky little melody and I knew that Isaiah Cooper, one of our long time trombone players would have some fun learning to play this. And I think it shows in his playing on this recording. So getting to this took a bit of work, a key change and some reimagining of the tempo, but the end result is a nice trombone feature. Bei Mir Bistdu Schon is one of those songs that has a number of iconic performances. So it took a while to figure out how much we would play homage to those performances and how much we would forge our own interpretation of the piece. This arrangement has been rewritten so many times that I fully expect it may yet change again. There’s lots of part doubling so that everyone can lock in just by listening to one another. I enjoyed writing the call and response for Dalton’s solo and the band really starts swinging hard on the call and response between the brass and everyone else. Jackie and Hedda sound so tight on this song. You can hear how well they blend on it. And while working on this chart I found some ways to write that mostly allow for the horns and the voices to work together. Chiribiribomis an arrangement by Christina Crowder that features the Seltzer Sisters interpreting the song in a way that’s a tribute to the legacy of the Barry Sisters. I like the way Christina’s lines support the singers and stay out of the way of their trickiest lines and some fun little moments where everyone really has to focus to make the lines all work. Lots of energy throughout this chart. Christina has a great solo in the middle. Ale Brider has been in and out of the Nu Haven Kapelye repertoire several times over the years. It was arranged and brought to the group by one of our violinists, Yoni Battat. Yoni sang the song at least two different times at December 25 concerts. 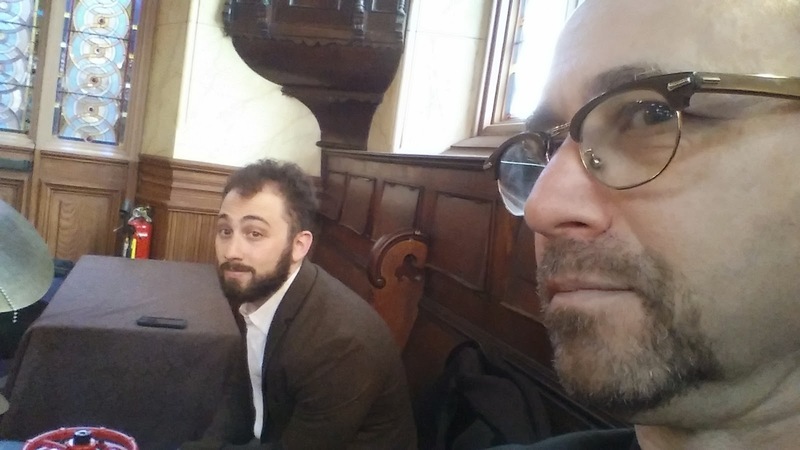 But then Yoni moved to Boston--at first for school and now for his career--and he couldn’t play or sing with the Kapelye as much (and the fact that he took time out of his schedule to come and be a part of these sessions is something I will always be grateful for). I got the thumbs up from Yoni to take his arrangement, change the key, and make just a few other fixes and voila, a feature for the Seltzer Sisters. The entire group even gets to sing a few bars at the beginning. Grossis an arrangement by Louis Polisson. Lou grew up playing the concert every December 25 and I can still remember how excited he was to have the Kapelye play one of his arrangements. This is our most modern piece on the album, it’s a tune by the fantastic Israeli group, Balkan Beat Box. The arrangement features Lou and Henry Sidle in an epic guitar battle. And when we’ve played this song live we really stretch out the drum solo. Zorg Nit Mama. As I mentioned earlier, for the past few years I have been using music from various collections of Klezmer and Jewish dance music for practicing sight reading. I find the recursive aspect of practice teaches me elemental language and phrase ideas from the music and I enjoy seeing what something I like hearing looks like. But all of this is such a slow process. So slow I don’t know if I can really tell when things have at all changed. I just know when things come more easily than they have in the past. So I was surprised when I came across Zorg, in a copy of some music that I had borrowed from clarinetist Jim Serling. When I played the melody for the first time I was grabbed. The ideas for this arrangement came fast. I heard that repeating trombone line grooving hard against the melody and I stuck with my first impression. I began to hear how it would feel if it was accompanied by a Motown/Stax influenced rhythm section. Then it was just a matter of figuring out the horn parts and the various accented hits that the piece would need to come alive. The organ solo by Dani Battat is the only overdub on this track. Everything else happened in the moment, including the upright bass and drum interaction during the organ solo which Jesse and I improvised in an inspired moment during the sessions. One last thing, as you might guess from their last names, Dani and Yoni are family—they’re first cousins and this track is their first recording together. Dovidl Bazezt Die Kalleh is a reimagining of some music I first heard on a recording made by clarinetist Dave Tarras in 1926. Anna Reisman replaces Tarras’ clarinet with her flute and she plays the opening doina and after she makes us all cry the rest of the band kicks into gear when we get to the happy celebratory freylekh. I opened up the solo section here and created a solid backdrop for the instrumentalists to improvise. I could imagine a live version where we open it up even more. Gas Nign. This tune has been in and out of the Kapelye’s repertoire for at least the past five years. We first started playing it long before I began trying to write more elaborate arrangements. I found this melody early in my reading of Beregovski’s collection and made some basic lead sheets for it. To date I have yet to go back and do something more with this tune. This performance continues that practice. I worked out this head arrangement on the day of the recording. Jesse counted us in and away we went. Everyone had a chance to be featured and we all listened to each other. Nice feel from beginning to end. Everyone really sounds like they are listening to one another. Hora Midor di Romania is an arrangement based on the 1920 Abe Schwartz recording. I had a lot of fun figuring out how to arrange this piece for a large group. I like the way violins and other instruments interact in the second section of the hora. Everyone was singing on their instruments. And then the band leaps into dance mode and transitions into a solid Freylekh dance feel. There’s a lot of energy in this part of the arrangement and I think the soloists, Eli Zabin and Steve Jacobs really play of that. Finally the band comes back in after the solos to bring the song home. There’s a great feeling throughout the band as they come into a classic Klezmer ending. Really happy with how that came out. Eliyahu HaNavi began as an arrangement almost 18 years ago. I first wrote and played it with Bassology, a band that I led mostly in the late 1990s. And the tune has continued to follow me. This arrangement was developed by Will Bartlett for a high school jazz band in Ohio. I adapted it for the Kapelye and we have been playing it ever since. It’s a great feature for the band members and Will’s quote of “Joshua Fought the Battle of Jericho” is a great start to the energetic finish of a chart that equally engages and entertains the band and the audience. And as I finish pasting the announcement into the blog post a voice in my head with a thick Eastern European accent says, "Oy, and so now he uses the blog to announce gigs?" The Spies of the Balkans is a musical configuration whose music is shrouded in enigma and mystery. Reputedly the group plays music that explores the intersections between cultural identity, groove and the harmonic minor scale. What does that mean? Well, as spies the group is willing to take on different identities and explore the sounds of those identities. Of late that has mostly been music from Eastern Europe with a mix of funk, jazz and jam. But if needed, this identity could be shed and abandoned for something completely different. Curious? Frightened? So is the NSA. Come hear the band that no one will admit on record to knowing anything about. About a month and a half ago I reached a personal milestone that felt important to me but I was very busy and I didn’t have time to write about it, but for the first time in a very long time I felt a compelling need to get something written. I had passed the one year anniversary of regularly and systematically playing one tune over and over, practice session after session. The idea isn’t original to me. I have long been familiar with some of the teachings of Lennie Tristano though I haven’t always used them in my own practice routine. I knew that he had his students work through their ideas using only a limited number of chord progressions. I’d dabbled with the idea before, but now I wanted to take it to a much deeper level. The germination of the playing began sometime in August/September 2014. Sometime in there I decided to systematically work through a series of rhythmic exercises while working exclusively on one piece of music. And I knew just the piece that I wanted to learn, John Coltrane’s “Giant Steps.” That piece, long considered a milestone work by me and my many friends in jazz, was something of an Achilles’ heel for me. I’d played it quite a few times, but found it hard to follow and I often got lost playing it. I found it in some way to be the kind of tune that seemed more like a test than a tune. “Can you play “Giant Steps”?” was an intimidating question and one that would cause me worry if it was asked on a bandstand, especially if it was my first time playing with someone. I didn’t want to show my ignorance or reveal my inability to keep those tricky changes properly organized in my head. And so every year or so I’d play “Giant Steps”. Invariably I would get lost somewhere in the jam, and have little or nothing I could say profoundly on it on my instrument. And then not play it again for a long, long time. So, over a year ago I made it my practice to work on “Giant Steps” at least 3 or 4 times a week. I’m a person with limited practice time so I tend to create intentional activities that can teach as well as reinforce more than one conceptual aspect of my development at once. And so I knew or at least I hoped that by picking a piece and picking an exercise I would learn both at a profound level. The exercise I was doing comes from one of Jerry Bergonzi’s books on Improvisation, Melodic Rhythms. Early in the book there is a multi-page series of exercises that takes 22 short one bar rhythms and moves each rhythm through the bar so that if you do all of the exercise you will end up playing the same figure but displacing it so that eventually you play it beginning on every possible part of the beat. I’d done the exercise a number of years ago, but this time I was going to apply it systematically to this one tune “Giant Steps”. At first my practice sessions were quite difficult. I had trouble keeping focus. I could not play through the tune without some kind of major error. I got lost a LOT. I had trouble hearing the chord progression despite the fact that I was using a play-along recording. But little by little I noticed that I remembered more of the changes and could successfully get through the tune with fewer memory issues or problems finding the tonally correct notes for the chord at hand. After a while I could, with some effort, work my way through the daily rhythmic figure and play it very slowly, and then a little faster along with the play-along CD. I was like a musical version of the little engine that could. I kept at it each day. One of the big breakthroughs was when the chord progression was finally deeply embedded in my mind and I wasn’t relying on looking at the chords. When that happened I could begin to imagine what I was about to play. As that happened I was able to create different musical shapes and they often came out the way I wanted and correctly. Of course there were and still continue to be plenty of moments where I have train wrecks. But somehow I am more comfortable with them and I can hear my way out of them and back into the chord changes. The thought came to me early this September. I thought to myself, I’ve been doing this project for a while now, how long have I been doing it? I thumbed through my practice log and traced my work back to last August. It had happened and I’d missed it. I was so busy doing the work I missed the anniversary. I’d played the tune for over a year. This discovery, for me, was anticlimactic. As far as I had gotten I am close but not done with this exercise. I still haven’t finished working through every permutation of the rhythmic figures in the exercise. And in the year since I've started this project I've come up with a list of other exercises I want to explore. The problem with limited practice times is there is just never enough. And there is so much that I want to work on (But I here I begin to ramble as there is no conclusion. There's just getting back in the practice room and continuing the process. With any luck I'll be inspired again in the near future to write, but the music comes first!). 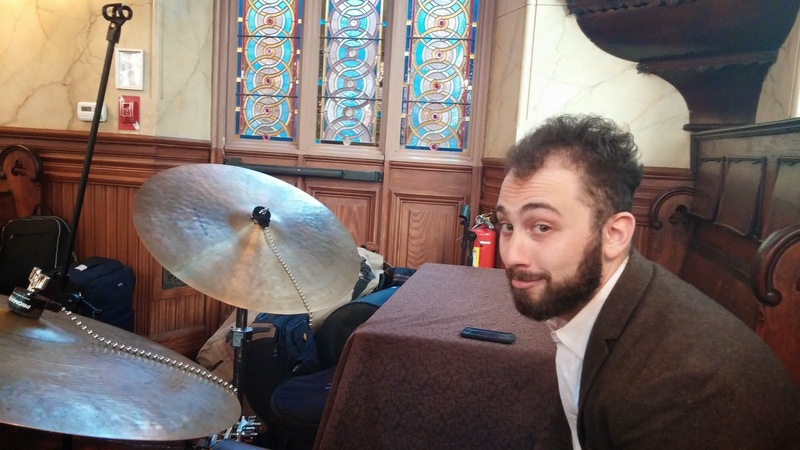 Last Sunday several band members were invited to accompany Cantor Jack Mendelson at a baby naming. Jack was in great voice and we all had fun making music together. Here are some candid shots from the day.